USDJPY: The pair continues to retain its upside pressure following a rally on Thursday. This development leaves risks of more recovery towards 112.14/50 levels. Further up, resistance resides at the 113.00 level. A move above here will open the door for more gain towards the 113.50 level. 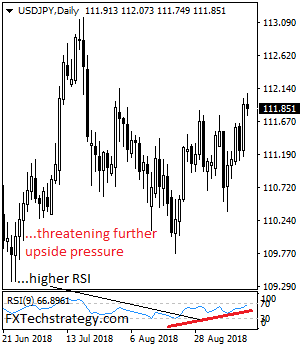 Further out, resistance resides at the 114.00 level with a turn above here aiming at the 114.50 level. Its daily RSI is bullish and pointing higher suggesting further strength. On the downside, support lies at the 111.50 level where a break if seen will aim at the 111.00 level. A cut through here will turn focus to the 110.50 level and possibly lower towards the 110.00 level. On the whole, USDJPY faces further upside pressure.